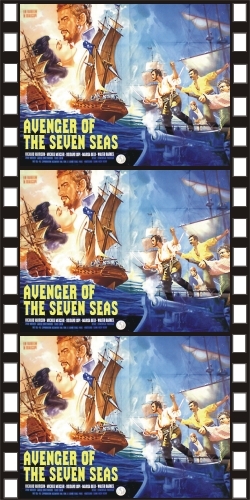 AVENGER OF THE SEVEN SEAS—Widescreen Ed. (1962) Richard Harrison, Michelle Mercier, Roldano Lupi, Paul Muller, Marisa Belli. Harrison, a seasoned British navy officer, goes toe to toe with his own captain, who has thrown Richard’s brother in the brig. After freeing his brother, Harrison joins up with a band of pirates to take down his corrupt commanding officer, who has now also murdered Richard’s father. Things eventually end up on a cannibal island with a search for hidden treasure. There are many plot twists, but this film is essentially wall to wall action for much of its running time. Watch for the man-eating plant scene. There’s also a cool duel using harpoons! Great fun. Our version blows the free version on Amazon Prime out of the water. Great color, Widescreen, 35mm.